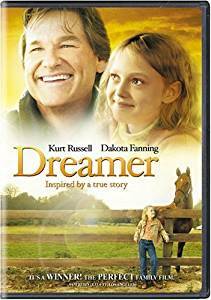 Dreamer is about a race horse who breaks a leg during a race, and a man at the stable gets fired for accusing his boss that it's his fault. He gets paid $6,000 in cash plus the horse with a broken leg. He takes the horse home and manages to heal the leg with the help of a vet and his dad. When the horse is fit enough the decide to enter the horse in a claiming race, thinking that nobody would claim a horse that had once a broken leg... especially since you have to make the claim before you've watched the race. Sonador (the horse) gets claimed and the man's daughter is extremely upset. The daughter is very depressed for days until the man buys Sonador back and puts the horse in his daughter's name, she is now in charge of everything. He manages to get her in the Breeders cup! Does she win or not? That's for me to know and for you to find out! This movie is my favorite horse movie EVER!!! 5 stars!!! Dreamer was so inspiring to me. It led me to love horse racing and I love horses even more. I love Dreamer! It's an awesome movie! I just watched this movie and I loved it! It is so sad when Sonador breaks her leg. I love it sooooo much and you will too! I am going to watch this movie tomorrow. I just got it and it will come tomorrow. It sounds so good! I have wanted it for a while but now I finally get it! This movie was AMAZING! I'd definitely recommend it to anyone. Dreamer is the best movie I ever seen. It's just like Secretariat but his story is way different but it's a bit different. My dad's horse has his blood. The best movie! I have it! I love this movie! Hands down the best horse movie ever! I got this movie for Christmas. I love this movie - best ever!!!! This movie is one of my favorite. It's so awesome. This is such a great movie. I just love it. The storyline is awesome. i love this movie it's one of my fave movies. i think the funny part of the movie is when the dad tells kel that he knows that she is giving the horse popsicles so that is one of my fave movies. I want to see this I've read the book. Very touching film! One of the best horse movies I've seen yet! One of the best horse movies ever! the game is even better!!!!!!!!!!!!!!!!!!!!!!!!!!!!!!!!!!!!!!!!!!!!!!!!!!!!!!!!!!!!!!!!!!!!!!!!!!!!!!!!!!!!!!!!!! this is one of the bestest horse movies i've ever seen and stars one of the most beautiful horses i've ever seen. i recommend it for any1 who loves horses! Love it n have it! I love this movie! iT IS GREAT! Really close to being like Scarlet's Web at first and in some parts but I still like it! This movie is one of my Favorites. We watch it over and over again and never get bored from it. I recommend it to all the people who love/like Horses. sooooo GOOD MOVIE!!!!!!! i'm seeing it with my friends 4 my birthday party!!!!! Dreamer is a very truthful movie or i guess you could say story and sonodor was beautiful and tough enough to race again after what happened. Dreamer is a very thoughtful and amazing also a sad movie but it is a very fantastic story. This movie is Great! If you like horses watch this movie. It is sad at the beginning but ends happy. I Love Dreamer!!!!! this movie is rated for top ten for a list and this is the best!!!!!! YES it IS normal to race horses at an early age bUT just as with a ballet dancer - they SHOULD wait to race them till they are mature as their bones are still young and not strong. NO Ballet dancer goes on Toe until their bones are strong and no horse should be raced until the same - THEN they wont' break down as they do! Its normal to race racehorses at an early age. ANEY horse crazy girl would know that!!!!!! wow this is the best horse movie EVER!!!!!!!!!!!!! Dont miss it or you'll be sorry!!!!!! This movie is a fairytale! Race horses that break their legs do not get saved. Look at Barbaro, and Eight Belles and Ruffian! This movie glorifies horse racing and it is a CRUEL sport - they are running BABIES - not grown horses. The babies legs are not strong enough or mature enough for this but the owners want money and NOW so they race them anyway! I saw this movie a while ago and I think it is one of the best Horse movies ever. I especially like that she feeds Sonador popsicles!!! If they REALLY loved the horse they would not race it. Racing is just plain cruel. They take babies and beat them till they run their hearts out - like Barbaro and Eight Bells! i loved this movie. a young girl gets a race horse that hurts its leg it sends up racing again with her as the owner. I rented it with my mum because I love horses! I fell in love with the movie the first time I heard about it. I can watch it over and over again and it never gets boring. It made me cry when I first saw it. If you have never seen this movie then you need to go buy it and watch it. If you do, trust me, you will love all. I'm gonna tell you this is the best movie I have ever seen! YOU HAVE TO WATCH IT!!! I watch dreamer every chance i get. Plus my fave actress is in it... DAKOTA FANNING! I love dreamer so much! This movie is my favorite horse racing movie! I JUST LOVE HORSES!!!!!!!! "You are a great champion. When you ran the ground shook, sky opened and mere mortals parted. Parted their way to victory. And i'll meet you in the winner's circle. Where I'll put a blanket of flowers on your back." Dreamer is the story of a young girl, Cale (Dakota Fanning), who longs for a close relationship with her adored father. Ben Crane (Kurt Russell), Cale's father is a great horseman who sacrifices everything to save an injured racehorse, Soñador (called Sonya - means "dreamer" in Spanish). Sonya's bright future on the racetrack is suddenly cut short by a career-ending broken leg. Out of love for Cale, Ben rescues Sonya from euthanasia and takes the horse as severance pay on the day he loses his job. With unstoppable faith and determination, Cale unites two damaged souls, the father she adores and the horse she loves. Together they surmount great hurdles, both physical and emotional, to compete in the Breeders' Cup Classic, trying to turn broken dreams into a miraculous, many-faceted victory. This is a great movie and i REALLY enjoyed it! i think other horsecrazy girls will to! such a great horse movie! It's about a racehorse who breaks her leg, she is to be put down but the daughter of the race track vet wont let it happen so the vet buys her then heals her back to her normal self. such a great movie!!! Its about a little girl who's dad is a worker at horse races. Then one day the lil girl goes with and Sonador (Her dad's boss's horse) has a wreck and breaks her leg. They say she'll never walk again but watch how daughter and father nurse her back to health and enter her in a very important race!!!! This movie is absolutely perfect, very clearly demonstrating how thoroughbreds and other horses can recover after breaking legs. It is a heart wrenching movie about a girl and her horse. i memeorized every... sigle... word! i love it. Dreamer is an amazing movie and it is truly inspirational! Oh yeah, that kid who plays Cale Crane is an amazing actress! In case anyone is interested, her name is Dakota Fanning. Three cheers for Dakota fanning! Hip-hip hooray, Hip-hip- Okay yeah I'm done. this is a great movie! you should definitely watch it!!! Dreamer is about a horse named Sonador(thats spanish for Dreamer,it sounds like Son-ya-dore),a girl named Cale Crane and her father.Sonador is a race horse, a two year old filly.She has only ran in two races and has won both of them.Just before her third race Cale's father, who works at the stables where she lives, tells her owner,Everett,that she should'nt race thet day because she is standing funny on one leg.Everett races her anyway and,sure enough she breaks her leg.Everett says to put her down and Mr. Crane gets angry because he thinks the horse could be saved.He begins to yell at Everett and he ends up fired.He reminds Everett that he ows him $9,000.Everett offers to give him $6,000 right then and there and the other $3,000 later.Mr. Crane says he'll take just the $6,000 if he can have the horse too.Everett agrees.So he takes the horse home with him and sets her leg.She gets better and they decide they will breed her with a good stud and make some big money off of her foal.They are extremely disappointed to find out that she is infertile.Then at one point Cale over-hears her parents talking about Sonador, and how if Cale hadn't of been with him he would have left the horse at the stables.Cale is angry and decides to run away.So she tacks up Sonador to run away on.But when Mr.Crane comes into the barn a door slams and Sonador bolts.So when they finally catch her and are sure that Cale is all right,they decide that the horse is fast enough to race.They enter in a claiming race,thinking that no one will buy a horse that had a broken leg.But, she does get claimed and Cale is very upset.Her father buys the horse back and puts her in Cale's care.They find a way to enter the horse in the Breeder's Cup race.The ending,though a little unrealistic, is pretty happy. This movie is a good, and fantastic movie. I recommand it for all ages! a horse breaks its leg and the daughter gets her dad to try to fix the leg and there is a rival human who the kids horse is going to go against in the biggest race of their lives. It really could happen in real life. This movie is about a racehorse who broke her leg in a race and goes on to win the Breeder's Cup. Dakota Fanning is this movie so it is extra good!!!! A must see!!! its sad at the start but by he end its extra funny and i wanted to see so much more its great!! I love this movie! It's great for everyone, because it reminds them to believe in their dreams. Dreamer was an amazing movie!! It starts out with a family that lives on a farm without any horses....I'll let u find out the rest! watch this movie because if u like horse racing you'll luv this movie. Such a touching and moving story about a girl and her horse, lessons for people too! Cale is a great character! I love her! I love her personality. I love how she was so determined to help Dreamer. By the way Dreamer is one of the most gorgeous horses I've ever seen! THIS MOVIE IS GREAT! It made me cry ....and I NEVER cry! 2 really great horse movies are Dreamer and Moondance Alexander. Dreamer is about a horse who breaks its leg on the track. With love and care Cale, an 11 year old girl, helps, with her fathers help, get the horse back on the track and in time to race. Moondance Alexander is about a girl who gets picked on because her name is Moondance. She meets a horse and trains it in time to compete. These are both really GREAT movies. Enjoy! In dreamer, a racehorse injured from a racing fall gets everything she needs. When a little girl falls in love and someone buys her. She just can't bear to hear her father's voice. I cried and laughed. This is a great movie!